Astrology is ultimately about sight, visibility, vision, day and night, dark and light. Most people may know their Sun sign through their horoscopes, but most are surprised to learn that all of the planets were in signs at the time of their birth, so you have a Moon sign, a Mercury sign, and soforth. I use the tropical zodiac which is defined by the Earth’s gradually precessing equinoxes and solstices with the Sun. The zodiac is a division of the circle into 12 equal 30-degree segments called signs. Why are there 12 signs? I think we can answer this by considering a related question – why are there 12 months in a year? The etymological origins of the word “month” relate back to the word “moon”, which is an important clue. The Moon’s synodic cycle with the Sun is ~29 days long, approximately the length of a month, 30 days. We have ~365 days in a year, which closely corresponds to the 360 degrees of a circle. This means the Moon completes 12 synodic conjunctions with the Sun over the course of a year. This recurring solunar cycle I believe is the basis for 12 months in the calendar year and 12 signs of the zodiac. These 12 lunar cycles are conveniently divisible by the 4 equinoxes and solstices to which the tropical zodiac is now tied. How do we know what each sign means? Each sign has a certain quality associated with the degrees of light the Earth receives on each hemisphere from the Sun. 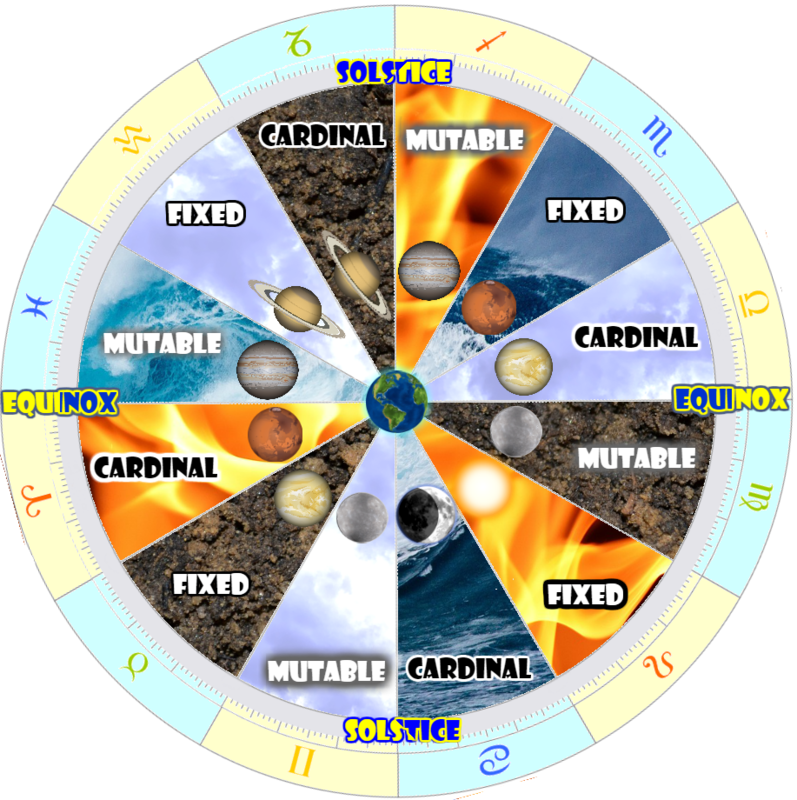 The equinoxes and solstices are the turning points of Earth’s relationship with the Sun, so the signs associated with those times of the year (Aries, Cancer, Libra and Capricorn) are considered to be cardinal, initiating, active. The month following those turning points are when the new season is solidly in place, so the signs associated with those times of the year (Taurus, Leo, Scorpio and Aquarius) are considered to be fixed, static and sustaining. After that, the Earth is between seasons as the old one is passing and a new one is arriving, and so the signs associated with those times of the year (Gemini, Virgo, Sagittarius and Pisces) are considered to be mutable, changing and inconstant. Half the Earth is facing away from the Sun at any given time, so half the Earth is experiencing night while the other half is experiencing day. Similarly, half of the signs have more Sun-like diurnal qualities: active, emanative, generative, creative, while the other half have more Moon-like nocturnal qualities: passive, reflective, receptive, absorptive. They alternate, starting with the equinoctial signs as diurnal signs. Aries, Gemini, Leo, Libra, Sagittarius and Aquarius are diurnal signs, while Taurus, Cancer, Virgo, Scorpio, Capricorn and Pisces are nocturnal signs. The signs are also associated with the 4 classical elements of fire, earth, air and water. The active fire and air elements are associated with the diurnal signs, and the passive earth and water elements are associated with the nocturnal signs, which alternate starting with the equinoctial signs as fire and air signs. So Aries, Leo and Sagittarius are fire signs, heated with fury and passion. Taurus, Virgo and Capricorn are earth signs, down to earth, settled with material senses. Gemini, Libra and Aquarius are air signs, up in the air with intellectual intangibles. Cancer, Scorpio and Pisces are water signs, fluid with depth of feeling. 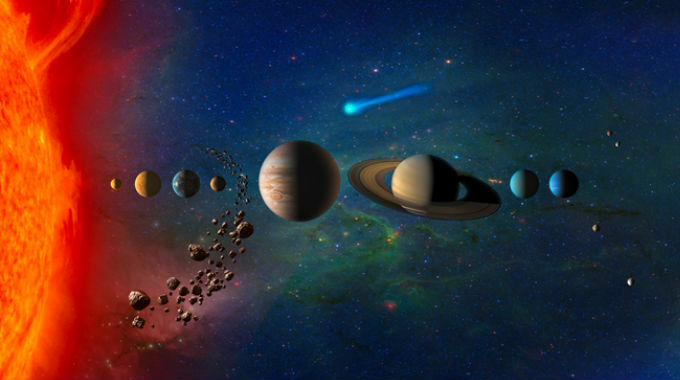 In addition, each of these combinations of qualities are similar to the natures of planets. Leo is the most Sun-like sign, since it is a diurnal, fixed, fiery sign, and the Sun is what gives us day, it can never go away, and provides heat like fire. Cancer is the most Moon-like sign, since it is a nocturnal, cardinal, water sign, and the Moon can be best seen at night, its cycle always starts again and is responsible for the tides in the ocean. 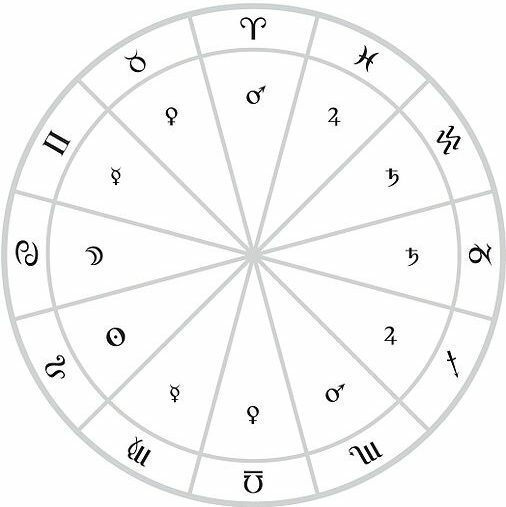 From the zodiac generated by the Sun and the Moon’s cycles, each sign is associated with the planets visible to the naked eye, based on its distance from the Sun, with a diurnal and nocturnal expression. Aries and Scorpio are the diurnal and nocturnal homes of Mars, which gives them their associations with risk, courage and danger. Taurus and Libra are the nocturnal and diurnal homes of Venus, which gives them their associations with pleasure and socialization. Gemini and Virgo are the diurnal and nocturnal homes of Mercury, which gives them their associations with intellectualism and craft. Cancer is the home of the Moon, which gives it its association with our bodies, origins and environments. Leo is the home of the Sun, which gives it its association with lights, leaders and identities. Sagittarius and Pisces are the diurnal and nocturnal homes of Jupiter, which gives them their associations with abundance and wisdom. Capricorn and Aquarius are the nocturnal and diurnal homes of Saturn, which gives them their association with laws and limits. How do we know what each planet means? The meanings of the planets have emerged through their visual appearance, their symbolic association and empirical observation. I also suspect that the behavior and interactions of planetary cycles are at the root of their classical benefic/malefic assignments, in a theory I outline here and below in this video. So each sign is a unique combination of its relationship to the equinoxes and solstices, its diurnal and nocturnal nature, its association with the elements and its association with the planets visible to the naked eye. And then you have the planets themselves which transit through those signs, which impart their significations to the themes associated with each sign. Here are the links to my interpretations of every planet in every sign, along with the Ascendant, Nodes and the Lot of Fortune thrown in for good measure. These are based on my theoretical understanding and my personal experience in observation, research and consultation. Enjoy!